Kids under 12 sharing with 2 adults deduct $300 from the Double Rate. Boarding your overnight flight, you’re off on your Italy adventure. Buon viaggio! Hail Caesar! All aboard our chariot for a panoramic tour of Imperial Rome including the Roman Forum, Largo Argentina (where Caesar was stabbed by Brutus), the Jewish Ghetto and the Circus Maximus. This morning, it’s a 5-minute drive to another country – Vatican City! With our expert local guide we’ll tour the Vatican Museums, a treasure trove of ancient Greek sculptures, medieval tapestries and Renaissance paintings. Our visit culminates in the Sistine Chapel, the room where the Pope is elected. Next we visit St. Peter’s Basilica*, by far the largest church in Christendom. We’ll see Michelangelo’s Pieta, sculpted when he was just 24, as well as Bernini’s seven-story bronze canopy located above the main altar. This morning we drive to Amalfi, one of the most famous coastlines on earth. Along the way, we’ll stop in Pompeii! Imagine, a city perfectly preserved as it was on that fateful day 2,000 years ago, when ash and lava literally stopped it in its tracks. You’ll see the tragic fossils of people attempting to escape along with children and dogs. Next we’ll settle into our home in Amalfi at the historic Hotel Luna Convento. She’s a 12th century convent converted into a charming first class hotel overlooking the sea. Tonight, dinner at our hotel with great local wines. Amalfi at our stern, Capri at our bow, this morning we sail to one of the world’s most enchanting islands. If weather permits, we’ll visit the Blue Grotto, famed for its translucent aqua-blue light. We’ll also tour the island followed by a well -deserved lunch with wine. Later this afternoon, we’ll sail back to Amalfi. Enjoy the night on your own - there are so many wonderful restaurants to choose from! What better way to visit the splendid towns of the Amalfi Coast than by sea! Today we’ll sail from Amalfi to Positano. (In case of bad weather, we’ll use our bus.) There will be time to explore this picture-postcard village set on a cliff dropping into the blue Mediterranean. From Positano, we sail to Sorrento, another gem in the Gulf of Naples with great views of the mighty volcano, Mt. Vesuvius. In Sorrento, we’ll enjoy lunch featuring the fresh specialties of the Campania region. We’ll drive back to Amalfi for your free night in this Mediterranean paradise. After a relaxing morning we’ll take the short, twisty ride up the mountain to charming Ravello. The town’s beauty is so inspiring that it’s attracted world-famous composers, writers and artists for centuries. We’ll visit the beautiful Villa Rufolo. The composer, Richard Wagner, fell in love this this place and annual concerts of his music take place here. Next, we’ll enjoy a wine tasting with the best Amalfi Coast wines and the famous LIMONCELLO liqueur. It goes down easily…but it’s also quite strong! Salute! Enjoy the final night of your tour with your new friends. Why not gather a few of your friends and go out for a pizza? After all – it was invented in this area. This morning your trip home starts at the Naples Airport. We hope you enjoyed Rome, Amalfi, your guide, your driver and your traveling companions. 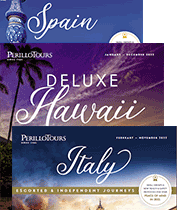 Buon viaggio and please join Perillo Tours again in the very near future. The renovation project, which has entailed the assembling of the two 19th-century buildings, allowed it to be nominated one of the three best hotel projects in the world by the “Mipim Award 2009” in Cannes. The Hotel has been granted a Five Star Diamond award for three consecutive years until 2011, when it has been included in the Condé Nast Traveler list of the 101 most beautiful hotels in the world. In 2014 it has won the World Luxury Hotel Awards. At the entrance the original “Map of Rome” drawn in 1748 by Giovanni Battista Nolli, gives guests a warm “welcome” to Rome! It is a rare masterpiece, genuine icon of Rome’s History. A location where the myth of Dolce Vita and timeless beauty hold hands, a few steps away from Piazza Barberini, Fontana di Trevi, Piazza di Spagna, and Villa Borghese. The Hotel Luna Convento Amalfi is an outstanding, top-quality 4 star hotel that provides its guests with a service that can only be described as impeccable. A magnificent location hanging right over the sea, luxurious rooms, delectable cuisine in stylish restaurants, an inviting swimming pool, an atmospheric and historic building and a group of highly trained and professional staff all combine to make the Hotel Luna Convento Amalfi a lavish 4 star experience.